August 25, 2008: When in space, keep an eye on the window. You never know what you might see. Above: Noctilucent clouds photographed by the crew of the ISS: more. Atmospheric scientist Gary Thomas of the University of Colorado has seen thousands of noctilucent cloud (NLC) photos, and he ranks this one among the best. "It's lovely," he says. "And it shows just how high these clouds really are--at the very edge of space." He estimates the electric-blue band was 83 km above Earth's surface, higher than 99.999% of our planet's atmosphere. The sky at that altitude is space-black. It is the realm of meteors, high-energy auroras and decaying satellites. What are clouds doing up there? "That's what we're trying to find out," says Thomas. People first noticed NLCs at the end of the 19th century after the 1883 eruption of Krakatoa. The Indonesian supervolcano hurled plumes of ash more than 50 km high in Earth's atmosphere. This produced spectacular sunsets and, for a while, turned twilight sky watching into a worldwide pastime. One evening in July 1885, Robert Leslie of Southampton, England, saw wispy blue filaments in the darkening sky. He published his observations in the journal Nature and is now credited with the discovery of noctilucent clouds. Scientists of the 19th century figured the clouds were some curious manifestation of volcanic ash. Yet long after Krakatoa's ash settled, NLCs remained. "It's a puzzle," says Thomas. "Noctilucent clouds have not only persisted, but also spread." In the beginning, the clouds were confined to latitudes above 50o; you had to go to places like Scandinavia, Siberia and Scotland to see them. In recent years, however, they have been sighted from mid-latitudes such as Colorado, Utah and Oregon. The genesis and spread of these clouds is an ongoing mystery. Could they be signs of climate change? "The first sightings do coincide with the Industrial Revolution," notes Thomas. "But the connection is controversial." 1. Noctilucent clouds appear throughout the polar summer, are widespread, and are highly variable on hourly to daily time scales. A movie made from daily AIM snapshots shows the 2007 NLC season unfolding over the north pole: watch it. 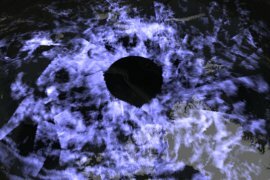 Right: A daily snapshot of noctilucent cloud activity over the North Pole in 2007. Click on the image to set the scene in motion. Credit: AIM/Goddard Space Flight Center Scientific Visualization Studio. 3. 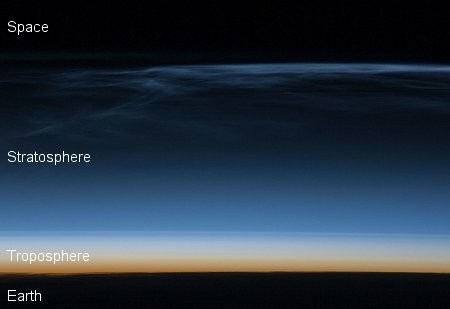 Some of the shapes in noctilucent clouds, resolved for the first time by AIM's cameras, resemble shapes in tropospheric clouds near Earth's surface. AIM science team members have described the similarities as "startling." The dynamics of weather at the edge of space may not be as unEarthly as previously supposed. Why did NLCs first appear in the 19th century? What is ice doing in a rarefied layer of Earth's upper atmosphere that is one hundred million times dryer than air from the Sahara desert? AIM has just received a 3-year extension (from 2009 to 2012) to continue its studies. "We believe that more time in orbit and more data are going to help us answer these questions," says Thomas. Meanwhile, it's a beautiful mystery. Just ask anyone at the edge of space. Krakatoa erupted in 1883, yet NLCs did not appear until 1885, a time lag of 2 years. "It took the atmospheric circulation that long to transport Krakatoa's ejecta (water vapor and/or ash) up to the 83 km region," explains Gary Thomas. "It is certain that NLCs were not observed in the summer of 1884." A German named T.W. Backhouse is often cited as the discoverer of noctilucent clouds, but scientific precedence should go to a different observer. Thomas explains: "We now give the credit for the first published account of noctilucent clouds to Robert Leslie of Southampton, England, whose letter appeared in Nature in July 1885, a month before Backhouse's letter (who acknowledged Leslie's earlier publication). Backhouse claimed that he saw the unusual clouds for the first time on June 8, 1885, nearly a month before Leslie's date of July 6, 1885, but his letter was not published in Nature until Sept 10, 1885. Backhouse has historically received credit for the first sighting, but Leslie is now cited as being the first because he published first." "Otto Jesse of Berlin and many others reported sightings that same summer. Jesse pointed out in a letter to Nature in 1890, that he had always paid great attention to clouds (in 25 years of observing), and 'on this account [on June 23, 1885] these bright clouds appeared to me the more surprising and puzzling.'"